Usually seen in female budgies that are reproductively active. It is usually associated with hyperoestrogenism or lots of the female reproductive hormone. Cere hypertrophy – is a keratinised growth on the cere - associated with excess oestrogen. A bit like our nails or Rhino Horn. Remove the nest and nesting opportunities. Social behaviour to reduce the bird's libido. One can soften the crust with mineral oil and peel it off. Alternatively Do nothing - as the cere hypertrophy in itself does not cause problems. Except :Budgie vets also note the long term health issues of chronic hyperoestrogenism including hernias, and other reproductive tract disease but , the cere changes in budgies are not usually an issue, in themselves unless a nare or nostril is blocked. 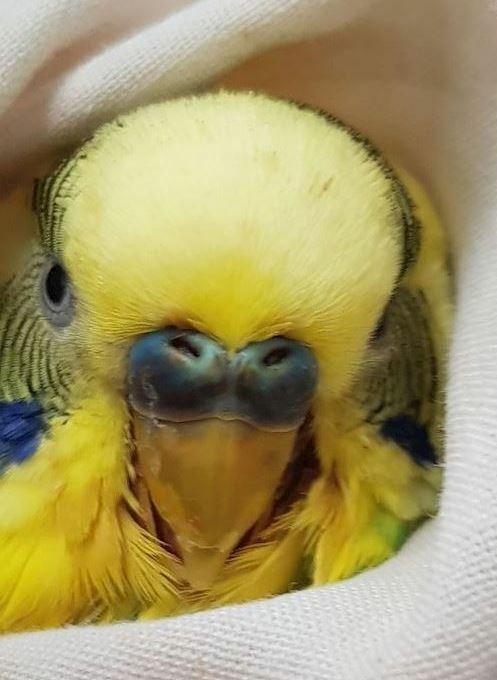 The blocked nostril , The expert budgerigars vet will remove the Keratin, and unblock the nose, the material in teh sinuses are then flushed out - A sinus flush procedure , and often a vit A injection is given. There are different shades of blue- dark blue is typically male. Light blue can be female. Is the cere colour in male budgies due to the presence of testosterone or possibly the absence of oestrogen? Dr Phil is not sure. It appears to me that sick male budgies often lose the colour in their cere (going almost white), presumably due to a decrease in circulating testosterone as part of a stress response. In other words does the brown cere colour appear because the testes stop producing testosterone, or because they start producing oestrogen? If this bird has had persistent obesity and subclinical hepatic lipidosis, sometimes mild color changes to the cere can accompany this problem in and of itself. Some say : Budgies with light blue ceres are usually female while males have darker blue ceres. What is the significance of a blue to brown cere color change in a male budgerigar ? Sertoli cell tumours usually start as small cystic-like structures on the testicle, only impinging on the sciatic nerve at the end stage of the disease. It is thought that the lack of the female hormone estrogen results in the characteristic blue cere we see, at the Budgie vet, in male budgerigars. . Blue cere changing to brown suggests not so much a lack of testosterone but an excess of estrogen. This is often associated with an estrogen-secreting Sertoli Cell tumor, of the testes. The blue color is due to the lack of estrogen rather than the presence of testosterone. Bird vet Dr Phil feels this issue is not really fully understood .